The Montreal Protocol is widely considered one of the world’s most successful multilateral environmental agreements, having phased out 97% of almost 100 ozone-depleting substances (ODSs) – placing the ozone layer on the path to recovery. Because many ODSs are also potent greenhouse gases, their phase-out under the Montreal Protocol has provided an often overlooked bonus for climate mitigation: Phasing out these 100 chemicals also has provided powerful climate protection, avoiding the equivalent of an estimated 9.5 billion tonnes of CO2 emissions per year – approximately five times more than the emissions reductions of the Kyoto Protocol’s first commitment period (2008-2012) (see figure 1). 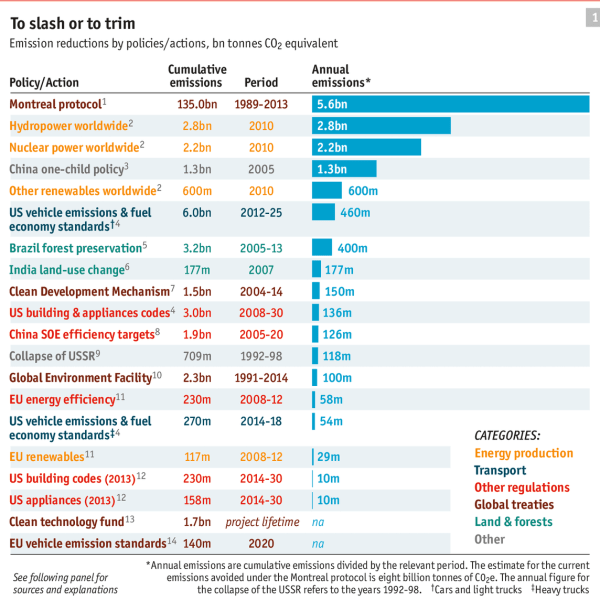 The Economist recently named the Montreal Protocol number one in policies that have done the most to slow global warming to date, ahead of hydro, nuclear, and renewables (see figure 2). 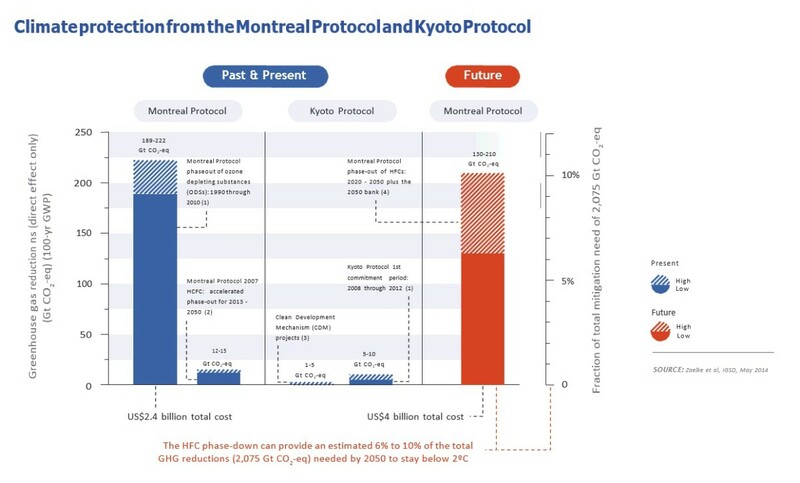 Fast action under the Montreal Protocol can limit growth of HFCs, prevent 100 to 200 billion tonnes of CO2-eq emissions by 2050, and avoid up to 0.5°C of warming by 2100 (Xu et al. 2013), with additional climate benefits from parallel improvements in energy efficiency of air conditioners and other appliances. At the international level, there is growing consensus that HFCs can be most effectively controlled through the phasedown of their production and consumption under the Montreal Protocol as a complement to controls of emissions under the Kyoto Protocol. The Montreal Protocol has the experience and expertise to ensure a fast, effective, and efficient phasedown of HFCs, which are in the same family of gases, have similar chemical properties, and are used in the same sectors as the CFCs already phased out and the HCFCs currently being phased out (Zaelke et al. 2012). World leaders recognized the threat posed by the growth of HFCs in the outcome document of the Rio +20 Summit in 2012 and called for the gradual phasedown of their production and consumption. 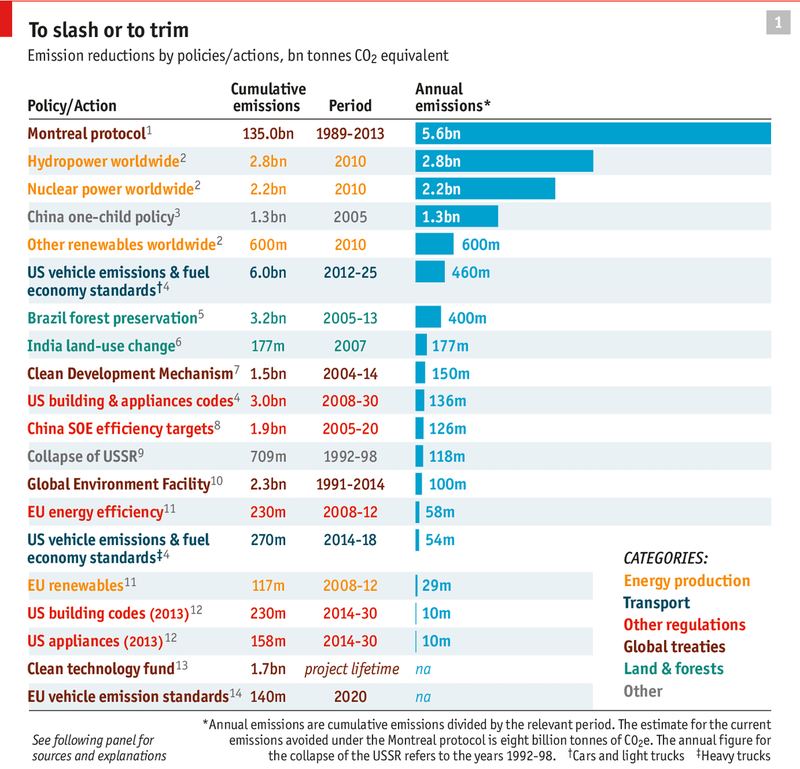 As of July 2015 five proposals have been submitted by a total of 95 Parties to the Montreal Protocol to amend the treaty to phase down the upstream production and consumption of HFCs (leaving the accounting and reporting of the downstream emissions in the UN climate regime). The 95 Parties include a coalition of island States let by the Federated States of Micronesia and the Philippines, the Africa Group of 54 Parties, the U.S., Canada and Mexico, the EU-28, and India. Fast action under the Montreal Protocol can limit growth of hydrofluorocarbons (HFCs), prevent 100 to 200 billion tonnes of CO2-eq by 2050, and avoid up to 0.5°C of warming by 2100. The Climate and Clean Air Coalition to Reduce Short-Lived Climate Pollutants (CCAC) is a voluntary partnership uniting governments, intergovernmental organisations, civil society and the private sector in the first global effort to address short-lived climate pollutants (SLCPs) as an urgent and collective challenge, in ways that protect the environment and public health, promote food and energy security, and address near term climate change. The Coalition’s work is complementary to the global action to reduce carbon dioxide, in particular efforts under the United Nations Framework Convention on Climate Change (UNFCCC).